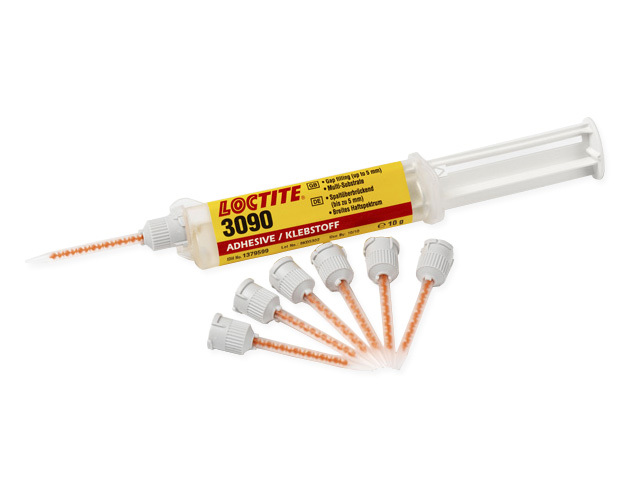 The selection of chemical agents in the TME range of products has been expanded by a new LOC-3090 glue. It is a two-component cyanoacrylate glue which incorporates high adhesion force, fast strengthening and the possibility of filling large slits (up to 5mm). This glue finds the application in joining of metals, rubber, wood, paper, cardboard, leather, fabric and majority of plastics. Gelated consistency allows the application of this agent even on vertical edges. The application and control of proper mixing proportions is ensured by connected nozzles (static mixers).